Gustavo Gutierrez: Spiritual Writings (Modern Spiritual Masters) ReviewDaniel Groody, professor of theology at the University of Notre Dame, and colleague of Gutierrez, has managed, in this slim volume, to serve up a tasty buffet of the choicest morsels of Gustavo's writing. And choosing which dishes to include could have only been a daunting task as Gustavo, who turned 83 this year, has been in the kitchen working out these recipes for a long time. Gustavo Gutierrez: Spiritual Writings is assembled from very recent works including a 2009 Theological Studies article and a forthcoming book, as well as selections from We Drink from Our Own Wells (1983), On Job (1987), The God of Life (1991), his work on Bartolome de Las Casas (1993), The Density of the Present (1996), and the early and formative volume, A Theology of Liberation (1971). The corpus of Gustavo's work represents a lifetime of practice, study, and reflection, from which he has developed a theology of how to be Christian and how to work out the gratuitous love of God which is both a gift and a demand on our lives. Groody's collection is a well done overview and synthesis of Gustavo's thought. For me, Gutierrez shines brightest when he exegetes Scripture. This collection does not disappoint, including lengthy extracts of Gustavo's work on the Beatitudes, the book of Job, and several other portions of the gospels. His reflections offer a fresh and insightful reading of these passages, prodding the reader to scratch below surface impressions and stretch beyond traditional and usual interpretations to see what scripture might mean from the perspective of those in most need, those for whom the words might have been most intended. These glimpses are tantalizing and draw one back to the original sources to gain a fuller understanding of Gustavo's thought on these scriptures. 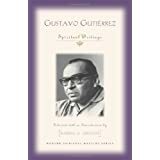 The collection contains a section in which Gutierrez commemorates, in brief sketches, the journeys of those who influenced and encouraged him such as Dom Helder Camara and Oscar Romero, and lesser known personalities Sr. Maria Agustina and Vicente Hondarza. Here we are treated to an inside look at the lives of both prominent and ordinary, and see how faithfulness and commitment quietly motivate and sustain through various kinds of suffering and injustice. The volume concludes with some of Gutierrez' most recent thought on his classic idea of the preferential option for the poor. In part he says, "The preferential option for the poor, if it aims at the promotion of justice, equally implies friendship with the poor and among the poor. Without friendship there is neither authentic solidarity nor a true sharing." For those familiar with the work of Gustavo Gutierrez, this collection will be a return to the feast of rich ideas and compelling reflection on discipleship and justice. For those new to this pastor and scholar, this volume of insight into the spirituality which has inspired Gustavo's theology will be a perfect introduction and will leave you wanting more. Want to learn more information about Gustavo Gutierrez: Spiritual Writings (Modern Spiritual Masters)?